Based on the tremendous reaction to this recent piece about sign language interpretation, we thought you might like to know more about it. Here are seven things about sign language that might surprise you. 1. Different countries have different sign languages. 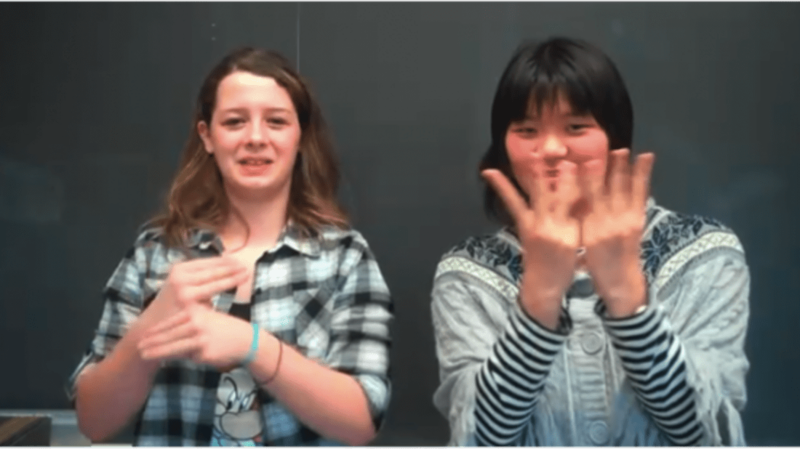 This is the sign for the word "math" in two different sign languages—American Sign Language on the left, and Japanese Sign Language on the right. Why should there be more than one sign language? Doesn't that just complicate things? This question would make sense if sign language was a system invented and then handed over to the deaf community as an assistive device. But sign languages, like spoken languages, developed naturally out of groups of people interacting with each other. We know this because we have observed it happen in real time. 2. Given a few generations, improvised gestures can evolve into a full language. In 1980, the first Nicaraguan school for the deaf opened. Students who had been previously isolated from other deaf people brought the gestures they used at home, and created a sort of pidgin sign with each other. It worked for communication, but it wasn't consistent or rule-governed. The next generation who came into the school learned the pidgin sign and spontaneously started to regularize it, creating rules for verb agreement and other consistent grammatical devices. Over time, it stabilized into a full-fledged linguistic system, ISN, or Idioma de Señas de Nicaragua. 3. Sign language does not represent spoken language. Because sign languages develop within deaf communities, they can be independent of the surrounding spoken language. American Sign Language (ASL) is quite different from British Sign Language (BSL), despite the fact that English is the spoken language of both countries. The above picture shows the sign WHERE in BSL (on the left) and ASL (on the right). That said, there is a lot of contact between sign language and spoken language (deaf people read and write or lipread in the surrounding language), and sign languages reflect this. English can be represented through fingerspelling or artificial systems like Signed Exact English or Cued Speech. But these are codes for spoken or written language, not languages themselves. 4. Sign languages have their own grammar. There are rules for well-formed sentences in sign language. For example, sign language uses the space in front of the signer to show who did what to whom by pointing. However, some verbs point to both the subject and object of the verb, some point only to the object, and some don't point at all. Another rule is that a well-formed question must have the right kind of eyebrow position. Eyebrows should be down for a who-what-where-when-why question (see ASL WHERE picture above), and up for a yes/no question. If you use the rules wrong, or inconsistently, you will have a "foreign" accent! The stages of sign language acquisition are the same as those for spoken language. Babies start by "babbling" with their hands. When they first start producing words, they substitute easier handshapes for more difficult ones, making for cute "baby pronunciations." They start making sentences by stringing signs together and only later get control of all the grammatical rules. Most importantly, as seen in the above video, they learn through natural interaction with the people around them. 6. Brain damage affects sign language in the same way it affects spoken language. When fluent signers have a stroke or brain injury, they may lose the ability to sign, but not to make imitative or non-sign gestures. They may be able to produce signs, but not put them in the correct grammatical configurations. They may be able to produce sentences, but with the signs formed incorrectly, creating a strange accent. They may be able to sign quickly and easily, but without making any sense. We know from studying speaking people that "making sounds" is quite different from "using language" because these functions are affected differently by brain damage. The same is true for signers. Neurologically, making gestures is quite different from using sign language. 7. Sign language is a visual language. This one is pretty obvious, but it's important to mention. Sign language is just like spoken language in many ways, but it's also different. Sign can be very straightforward and formal, but it can also take full advantage of its visual nature for expressive or artistic effect, as shown in the story in this video. Which, when you think about it, doesn't make sign language all that different after all. For expressive purposes, we can take full advantage of spoken language's auditory nature. We can also take advantage of facial expressions and gestures when we speak. Everything that would be in an artistic spoken performance—the words, the ordering of clauses, the pauses, the breath intake, the intonation and melody, the stressing or deemphasizing of sounds, the facial and vocal emotion, the body posture and head and hand gestures—come through together in sign language. It looks amazing not because it shows us what sign language can do, but because it shows us what language does.